Whether you are a sole proprietorship, multinational start-up or a growing enterprise, every company needs a strong and objective financial voice to guide strategy and execution. Think of your business as a car, with you in the driver’s seat. It needs fuel (resources) in order to accelerate (business growth), but it also needs a steering wheel and brakes in order to arrive at its destination without accidents. 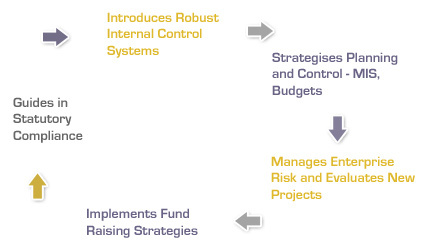 This is the role played by a CFO - steering appropriate control measures to mitigate business risk. The problem starts when business owners try to play both roles. When a CEO takes his eyes off the horizon and starts to focus on internal control issues, the business loses direction. Now you can avail of an unbiased specialist with an external viewpoint, who can provide you objective evaluation, relieve promoters to focus on core strengths and benefit the company with skill and experience. A Virtual CFO guides your organization to stay true to its mission. He is not a permanent employee, but acts as a mentor for the management in financial decision making.